Over the last decade we have seen a significant shift to digital documents and workflows across the business community. However, the reality is that very few offices are yet a genuinely paper-free environment. From office policies, to important emails and attachments, the average office still creates vast volumes of printed materials in a single day, many of which are sensitive or highly confidential. On-site shredding is the only true solution to ensuring that data in these documents is protected and the business is not exposed to unnecessary risk as a result of regular paper use. A comprehensive shredding policy will include the following document and media types. It’s especially important to ensure that individual confidential data is being properly disposed of, whether that’s bank account details for salary payment, or a disciplinary letter. You will also need to ensure that you have systems in place to shred other HR documents, such as corporate data and information, supplier records and data and purchase orders. The sales and marketing teams within the business can generate significant volumes of paperwork and some of this can be highly confidential and business sensitive. Contracts and NDAs, for example, need to be very carefully disposed of. Given the impact of the GDPR, it’s more important than ever before to ensure that you’re safely shredding anything containing customer data. And to protect the interests of your business, it will be key to shred documents such as training information and marketing collateral. Documents such as business plans, budget data and strategic reports could do a lot of damage if they end up in the wrong hands, so confidential on-site shredding is essential. Everything, from management accounts, through to key contracts and staffing information should be safely disposed of by shredding to keep the most crucial data about your business private. If your business is reliant on R&D for growth then it will be key to maintain strategic and competitive advantage by safely disposing of all the documents and media these processes generate. This could be anything, from product plans through to documents that concern formulas and experiment testing and technical drawings. It will also be important to shred paper evidence that relates to monitoring and evaluation. Business operations can create a huge number of documents that could be problematic if they are made available to those who shouldn’t see them. Documents containing critical data such as sales and service information and monitoring data, as well as appraisals and staff information all need to remain confidential. Any documents relating to disciplinary hearings or tribunal processes, as well as medical records could be a disaster in the wrong hands. Financial documents such as audits, bookkeeping reports and any accounting documents are also a top priority for confidential shredding. These are just some of the categories of document that should always be safely disposed of via confidential shredding. 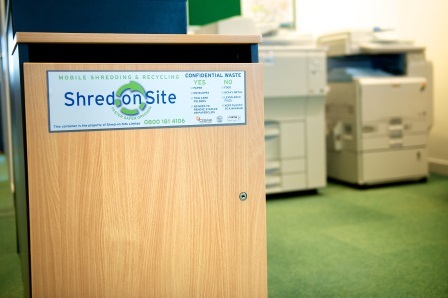 On-site shredding is the safest and most secure shredding option for any business – contact us to find out more.